Map Sources: Washington Gap Project 1991 Land Cover for Washington State, USGS shaded relief map of Washington, Washington State WRIA Map. Permission to copy map in printed paper form is granted for educational use. 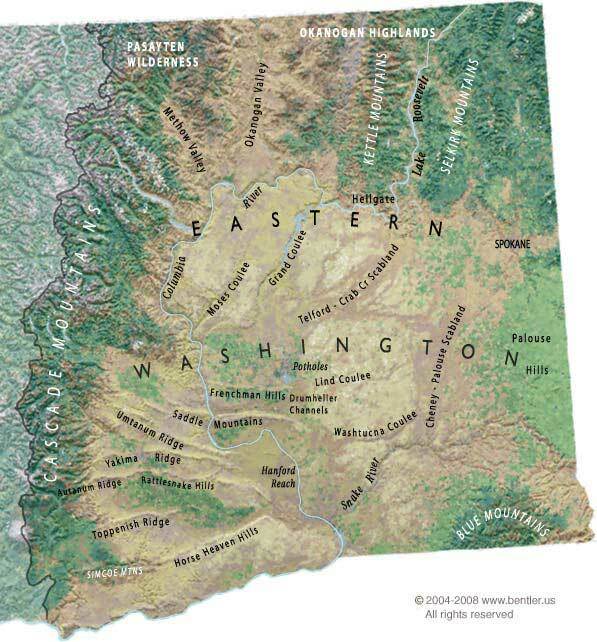 Eastern Washington is the area east of the crest of the Cascade Mountain range draining to the Columbia River. The map of Eastern Washington shows the region's natural features including ridges, inland mountain ranges, canyons, coulees and scablands and also displays irrigated farms, orchards, and vinyards, forested areas, shrub-steppe, dry farm and grassland areas. The land cover used for this map is based on satellite data gathered during the spring and summer of 1991. Great forces made Eastern Washington what it is today, from enormous lava flows that spread across the Columbia Basin millions of years ago to amazing ice-age floods that gouged the region's coulees and scablands, to human forces such as the Columbia Basin Reclamation project, which created new lakes, crossed the land with industrial-sized powerlines, and changed large areas of arid shrub-steppe lands to irrigated farmland. Eastern Washington's unique, often remote landscapes, wide-open views and frequent blue skies, distinct seasons and access to public lands help explain its attractiveness for exploring. For links to information about some of the region's flora, fauna, wildife areas and parks, see the links to the left. East vs West: Who's Greener? See the Eastern Washington maps collection for detailed road maps, wildlife areas, and historical points of interest. Related links also provide information about Eastern Washington geology, maps and landscape photos.